When the sun sets in Gishita, Rwanda the sky turns to dark blue velvet. Stars twinkle timidly and lights from little homes dotting the hillside turn on one by one. The hills—bright green during the day—roll on in succession, with only the moon to light their division. At night Bellia and her 6 year old adopted daughter Marie sleep in the same room. The quiet of home comforts them and Bible verses on the white walls whisper love and peace over them. Two cows low in the next room. For years in the orphanage, Marie went to sleep in a dormitory with more than twenty other girls, praying for a mother to tell her goodnight. She woke up without a mother to dress her in clean clothes. She breakfasted in a room with a hundred other children, and no one to make sure she got enough food to eat. She trekked home from school to a concrete building with no one to welcome her. She closed her eyes without anyone to tuck her in and kiss her forehead. Now, for the first time, timid Marie knows what it is to have someone who cares just for her as she falls asleep under Rwanda’s velvet night sky. In her husky child’s voice she babbles stories about her day, wonders aloud about everything she sees. She asks her mother serious and silly questions about what it means to be a girl navigating life at 6 years old. Her mother, Bellia, is a Community PEACE Trainer – a volunteer who trains families from her church about healthcare. As a mother to four grown children, Bellia’s heart has always been for children. When she heard teaching from the PEACE Plan about God’s heart for the orphan, she decided to adopt Marie. She now also assists other families who have reunited and adopted by doing home visits and providing parenting support. “I decided God has done well for me, so I will do well for God’s kids,” she says. Little Marie has been part of her new family for several months. It’s her custom when she meets new people to proudly introduce them to her mama. The blossoming love they share is evident to anyone who visits their home. Because of the local church and Rwanda Orphan Care Sponsors, Marie and Bellia’s unfolding story is made possible. Sponsorship allows Bellia to provide Marie with all the necessities, as well as her school fees and medical insurance. Bellia (left) with Marie (center) and Bellia’s grandson. All photos taken and used with permission. We are excited to announce that Esperance, an orphanage in Western Rwanda that was using children to grow and harvest pineapples, is down to just two children left waiting for families! When we began working with the local churches in that area in 2013, there were 130 children living and working in Esperance. Now 128 of those children have left the orphanage forever and each has been embraced by care of a loving family in the community – with your support and the diligent efforts of the local church in Rwanda! Ten years ago in Kigali, Rwanda’s capital city, an unspeakable tragedy left a young unmarried girl, Joselyn, pregnant with a baby boy. She felt ashamed and broken. Shortly after she gave birth, Joselyn’s aunt took the newborn and sent him to an orphanage hidden in the mountains miles from Joselyn’s home. Her aunt told Joselyn if she tried to find her son she would be arrested for abandonment. Last month, diligent orphan care volunteers from local churches near the orphanage began to unravel now ten-year-old Eric’s history. The story slowly unfolded. They found out this child living without hope of a family actually had a mother. When Joselyn learned that her Eric was waiting—parentless—she found new hope that she could reunite with her son once again. The orphan care volunteers talked Joselyn through the potential challenges of raising her son. Undeterred, she made the bold decision to bring him home. In the course of their conversations and parenting training, the volunteers asked Joselyn if she knew about Jesus, how He cared for her, how He had come to redeem her pain and make her whole. Joselyn accepted Christ that day in her home. She realized that her current accommodations—a small house doubling as the community bar—was no place for a child, and she chose to move down the street to a humble mud home, one with an extra room for Eric. 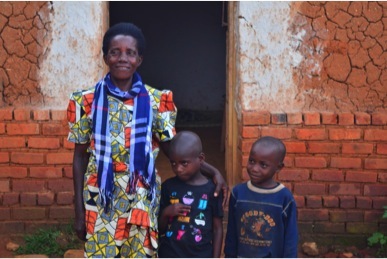 Mother and son are now back home in Kigali, adjusting to their new lives as a family. Through the generosity of sponsorship donors, Joselyn has the means to provide a better home and a smooth transition for her son. Eric will receive love from his own mother who can now provide medical insurance, school fees and the home he never knew. He will hear and experience the love of Jesus in the arms of his mother, with a family of his own. This month, members of the local Rwandan church have decided to take a local PEACE trip to fix up Joselyn’s home, making it more suitable for their little family. They plan to paint the walls and add windows to the small rooms. Through the love, care and provision of Saddleback sponsors and members of the local church in Rwanda, Joselyn’s painful experiences have been redeemed through their miraculous reunion, and a little boy’s future is forever transformed. You can help children leave the orphanage! If you are interested in helping families like Joselyn and Eric reunite, visit saddleback.com/sponsorship for more information. Laurence is a 17-year-old girl living with HIV in Rwanda. Lawrence’s parents died when she was just two years old, and she was sent to live in the orphanage. For fifteen lonely years, Laurence didn’t have access to the care she needed, and at times the painful skin condition she developed from her disease kept her out of school and isolated from other children in the orphanage. Laurence lived depressed and without hope. Because of her age and her HIV status, the orphanage claimed she was unadoptable—that no one would want her. Laurence couldn’t see an end to her loneliness. Through the Global HIV&AIDS Initiative and the Rwanda Orphan Care Initiative, Kabibi learned about Laurence, one of the last children left in the orphanage, and her heart broke. Kabibi knew God had redeemed her pain so she could redeem others, and she decided, no matter the opposition, she could be a mother to Laurence. Laurence saw that after years of living without a family, she could finally have a home with a mother who loved her deeply. She decided to go with Kabibi. With the help of the local church and Saddleback sponsorship, Kabibi has been able to adopt Laurence. Just a few days ago, Kibibi went to the orphanage to get Laurence. At last, Laurence left the orphanage and came home to a family of her own – to a mom who will love her and make sure she gets the HIV care she needs. Half of the children who lived in orphanages in Rwanda when we began two years ago now have a family of their own. Together as a church, we can reach the goal of zero children living in orphanages in Rwanda. Did you know you can sponsor a Rwandan family who is willing to adopt a child like Laurence? For just $38 a month you can bring a child out of an orphanage. Please visit www.saddleback.com/sponsorship for more information. Grace’s 11th birthday party looked the same as any eleven-year-old’s from the outside—children ran around her house in superhero costumes, eating cake and ice cream and playing games—but this eleven-year-old’s birthday party was different. Instead of asking for toys and clothes, Grace asked her guests to give to support orphans in Rwanda waiting to be adopted. Grace attended Saddleback’s PEACE night, and visited the Orphan Care breakout session. There she saw pictures of little Rwandan faces, desire and longing in their eyes, and Grace’s heart filled with love and compassion for children her age half a world away. She felt called to do something for them, and decided to be creative. After some thought, her mom suggested donating money from her birthday party rather than asking for toys like she normally would. Grace’s friends were very supportive of the idea, excited to be part of something bigger than themselves. Through her party, Grace raised $650, enough to support an adoptive family in Rwanda for over a year. One of Saddleback’s mottos is “Every member on mission.” Grace is just one example of a believer living her life on mission – using her influence to impact the world and God’s kingdom. After feeling God’s call, she did what she could to follow him faithfully, and He multiplied her efforts more than she could have imagined! Many people feel overwhelmed at the idea of tackling the orphan care crisis, but as Grace shows, everyone can make an impact. Together, through each of us playing the part God calls us to play, we can end the orphan care crisis by helping children remain in family, reunite with family, or regain a family of their own through adoption. If you’re interested in helping a family in Rwanda adopt a child from the orphanage, please visit saddleback.com/sponsorship. For other ideas of how you can get involved, join the Orphan Care Initiative breakout at PEACE night on November 22 at 6pm in Tent 3 on the Lake Forest Saddleback Campus! When ten-year-old Gideon was born in Western Rwanda, his mother was overwhelmed with the thought of caring for a child. 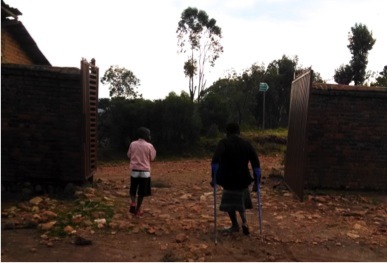 Physically disabled without the full use of her legs, she used crutches to walk on the hilly dirt roads and could find shelter only with her brother and sister-in-law who advised her to place her son in an orphanage nearby. Since that time, Gideon lived in the orphanage, working daily on the hillside growing produce to fill the orphanage’s coffers. He labored without the affirmation and love of a mother and father to help him through the day. Gideon had food. He had a bed. He had a place to live. But it wasn’t home. Recently the Rwanda Purpose Driven/PEACE Orphan Care Initiative began teaching the local churches about the effects of orphanages on children. Church members learned that life without the one-on-one care and attention of a parent takes a serious toll on children’s’ mental, physical and psychological development. Once they heard that families were God’s best design for children, the churches near the orphanage resolved, “If the orphanage is this bad, we must get the children out quickly.” They committed themselves to finding loving families for all the children in the orphanage, including Gideon, as soon as possible. Volunteers from the local church tracked down the story of each child and invited their relatives to the orphanage to meet their children again and receive parenting training and support. 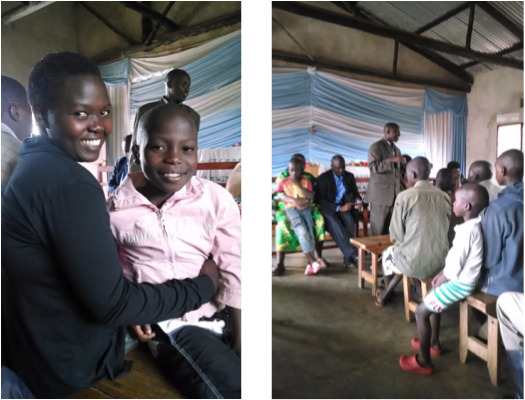 The church members used the training received from the Rwanda Purpose Drive/PEACE Orphan Care Initiative and taught the parents about the children’s situation in the orphanage, God’s Heart for the orphan and were presented an opportunity to reunite. Gideon’s mother was one of the family members in attendance. 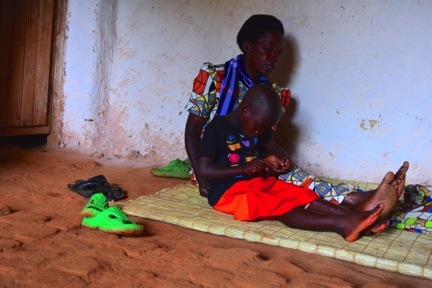 Her heart broke for her son as she sat there, yet she felt helpless to change his situation. She raised her hand to state her fears, “I understand the orphanage is bad, and I don’t want my son to be here, but I don’t know what to do. I don’t have another choice. I cannot take him to the place where I am staying- it is too small and the people who are kindly accommodating me won’t allow my son. Is there anyone who can help me find a different living situation- where I will have room for my son? I am in a training program for the disabled. I have a good job and can care for my son if I just have a little help in finding a new place to live. I’d like my son to leave this orphanage today, but I can’t take him home with me today.” Her love for her son and eagerness to never part from him again was palpable and everyone in the training longed to help. “Can he go with you today?” the mother asked hopefully, having watched her son hop from her lap to the arms of the Pastor all through the training. “Yes, today,” the pastor replied as the room broke into applause. The pastor committed to take Gideon home to become part of his own family until they could find a different living situation for his mother. Gideon’s mom would be able to visit and interact with the son she had been separated from for so many years. The church volunteers who are trained will make home visits and check on Gideon in the home. They will provide more parenting training and sponsorship support as he leaves the orphanage and ultimately is reunited with his mom. 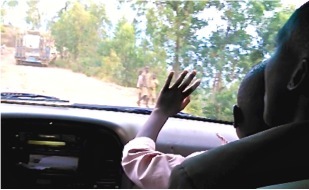 Leaving the orphanage later that day, Gideon sat on the pastor’s lap in the big white van, waving at everyone passing with both hands. From his ecstatic grin it was easy to see his overwhelming joy at being free from the orphanage and the hope of being reunited with his mom soon. He waved wildly at every passer-byer on the road. The church leaders that had provided the training road along in the car, singing praises to God all the way. “Gideon, you look like you are running for President, greeting everyone on the road as we ride,” one of the church trainers offered gleefully. Gideon didn’t answer. He just kept smiling and waving, as if announcing the joyous news. For the first time in many years, Gideon will be taken care of by a mother and a father who will give him the care and attention he needs to flourish until his mom is able to care for him too. His mom had already made plans to visit the next day. Gideon has a home. He has a family. The road ahead looks brighter than ever before. If you would like to sponsor a family in Rwanda to be able to provide a home to children from the orphanage like Gideon, please visit www.saddleback.com/sponsorship. "No child belongs in an orphanage - every child deserves a family. And the churches are leading the way on this! Families are in churches. This summer in Rwanda, Pastor Rick hosted a delegation of 100 pastors and leaders from all over the continent of Africa who are looking to bring the PEACE Plan to their countries. These pastors were impressed to see how Rwanda is leading the way in emptying orphanages using the local church, and many are looking forward to bringing the vision to their own countries.